Michael Heslop is the artist behind the stunning Racehorse Legends stamp illustrations. 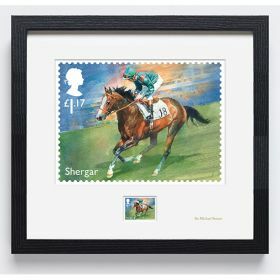 All eight Racehorse Legends Special Stamps are individually mounted and set in a black frame. Handmade for Royal Mail in the UK. All eight Racehorse Legends Special Stamps, individually mounted and set in a black frame. Dimensions W 33cm x H 18cm.